Hendrick Boards is among my favorite companies in existence. Run by two brothers, this skateboard & apparel company donates a massive amount of their profits (typically around 40%, depending on the item) to independent, deserving animal rescue organizations (they have more than 300 rescue partners!). When you shop with them, the donation sparked by your purchase goes directly to their rescue partner closest to your home (determined by your billing address). It’s a pretty fantastic way to donate to your local groups, which is why Hendrick Boards has developed such a massive following. There are some circumstances, however, that merit a slightly different donation structure. When an animal is severely ill or injured and requires extensive veterinary care, the boys of Hendrick Boards rally their troops to unite in one vital, life-saving fundraiser. 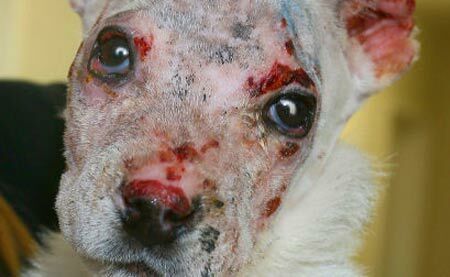 They are currently in the middle of such a campaign, this time to raise funds to help Nero, a 7-week-old puppy who was intentionally set on fire and barely escaped with his life. Fortunately he has been taken in by the Alberta Animal Rescue Crew Society, where he is being treated for extensive burns. He lost major parts of both ears, but miraculously his vision doesn’t seem to be damaged; however, he can’t yet fully close his eyes due to burnt eyelids, so his foster Mom has to administer eyedrops every couple hours. 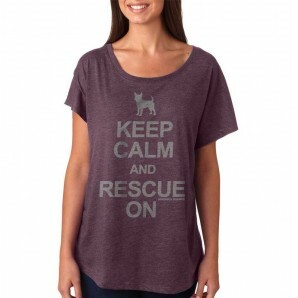 Nero’s veterinary care will no doubt be quite costly, so Hendrick Boards is donating $10 from the sale of any of their “Keep Calm And Rescue On” shirts to the rescue group incurring all of the expenses. Though the tragedy of this vicious, indefensible act of cruelty is heartbreaking, we can fight back by turning our anger into action and supporting the team of heroes working to show this angel the kindness and care he deserves. 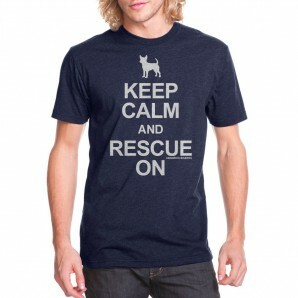 Please consider buying one of the shirts, and if you can’t (or even if you can!) please spread the word! Reblogged this on Surviving on Terra 3. Man’s capacity for cruelty never ceases to amaze me. We need more heros like that. Good luck to Nero on his road to recovery.